For better or worse, we Americans love our television shows. They’re an integral part of the American zeitgeist, helping to entertain us and serving as an artifact for future generations to know where we were as a society during specific eras. With the sheer size of the U.S., television also helps develop perceptions (justified or otherwise) about various regions. For instance, if someone were to say “New Jersey” to you, there’s a good chance you’d instantly think of Tony Soprano and his crew. 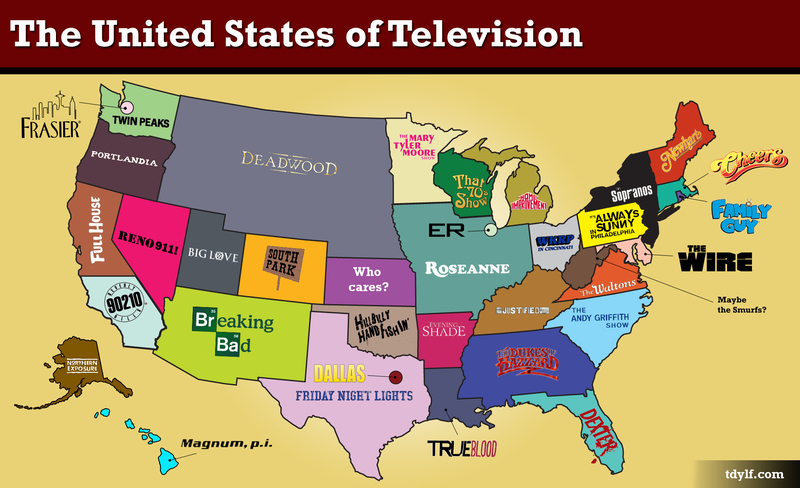 With that in mind, here’s a map of The United States of Television. Heh… I wish there were any shows at all to place in West Virginia but there really wasn’t anything. So instead of pointing that out, I shot for humor. It’s kind of the same with Oklahoma. I like Oklahoma, I don’t want to take digs at Oklahoma, but Hillbilly Handfishin’ really was the only show they had. Congrats on your LAMB Photoshop win! Nice map of the U.S.A.! television is now a part of everyone of our cultures! I love it. My only exception is I tend to think of California as “Weeds”. I figured I could get two more shows in by cramming in a Northern and Southern, and southern struck me as 90210. As a Kansan, I’m trying to figure out if my “Who cares” is better or worse than West Virginia’s “Maybe the Smurfs.” Either way, great map. Ha… thanks, and sorry. I’m a Missourian so I have a nasty habit of taking shots at Kansas any chance I can. Excellent work. You should add a dot in every state that has a Springfield (ie, every state) for The Simpsons. Also: I’m very happy that Friday Night Lights now represents Texas, relegating Dallas to regional dot status. Oooh, that Springfield idea is a great one. It does feel weird to have a TV map with no Simpsons. It was a tough omission. I sort of looked at it as a coin flip, and I watched a ton of Magnum when I was a kid. Watching Justified is exactly what prompted me to create this, because it’s so tightly tied to the state of Kentucky (and the region including Tennessee). Though I’m not educated enough to name many of the states, whichever one produced The Mary Tyler Moore Show… seriously, that’s the best you can come up with, random state? Ha… that’s Minnesota, where Castor and Ruth and a few others live. Also where the Coens are from (and where most of Fargo is based). They also had “Little House on the Prairie”, and I couldn’t find a decent logo for that show. Ahaah fun image John. I wish we was the state of Breaking Bad, fantastic TV show! Sadly, I’m stuck in Roseannasota. Very good and amusing in places.